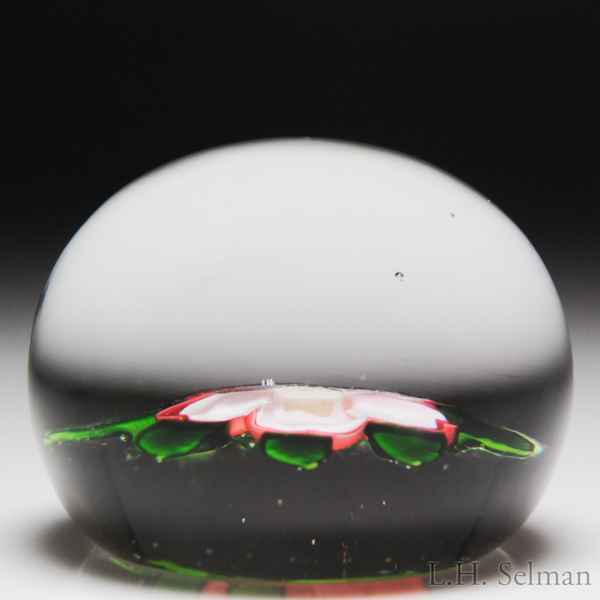 Antique Baccarat red and white dogrose miniature paperweight. A white dogrose, its slightly cupped petals rimmed in red, has a very pale yellow star/honeycomb cane at its nexus and sits atop a short, thick stem flanked by two ribbed leaves, one of them folded gracefully at the top. Four spaced leaves crown the flower, which rests over clear, star-cut ground. Diameter 1 15/16".